On the BGFF web site I show that the FMP itself is seriously flawed and that it is not an option to wait until the new FMP in 2014 to make changes, at least as far as Warrup is concerned. I also show that the reserve system of conservation presently implemented is flawed and inadequate. The Ministers statement that conservation values that occur in Warrup are adequately represented elsewhere in the reserve system is based on an assumption that the knowledge of values across all tenures is adequate. It is not. Page 9 parts 4.1, 4.3, 4.4, 4.5 indicate that research is still required that could justify the Ministers statement. 4.1 Assist with the development of a framework for designing a CAR (comprehensive, adequate and representative) reserve system. Aimed for completion by July 2010. 4.3 Complete investigations into the effects of timber harvesting (silviculture and fire) on forest ecosystems and ecosystem processes consistent with the Forest Management Plan 2004 -2013. Scheduled for completion by July 2013. 4.4 Devise, establish and implement a Forest Health Surveillance system for Western Australian forests consistent with the Forest Management Plan 2004 -2013. Scheduled for completion by July 2013. 4.5 Assist with the development of a conservation reserve biological database to support reserve management. Scheduled for completion by January 2012. History of the region, cultural values and Indigenous cultural values. Loss of habitat is the primary reason for the decreasing native forest fauna populations, with some species near the point of extinction. If there was the adequacy of representation in the reserve system of conservation values occurring in Warrup forest block, eight species of Flora and four species of Fauna would not have gone to a higher category of threat under the Wildlife Conservation Act 1950. Refer: Hansard [Legislative Council, Tuesday, 10 March 2009]. Three of the fauna species that moved into a higher category of threat, the red-tailed black cockatoo, brush-tailed phascogale and woylie, occur in Warrup and the adjoining Kingston FHZ. Refer: DEC Species and Communities Branch Dataset 23: Threatened Fauna. Ecologically sustainable forest management has obviously not been successfully implemented. The Warrup mixed old-growth / high conservation value forest should be added to the reserve System and not logged under any circumstances. Elaborate studies of the Kingston area have been carried out by CALM and the Utrecht University, Holland, in collaboration with CSIRO, over many years. Yearly reports were provided to the Chair of the EPA and the Minister for the Environment. 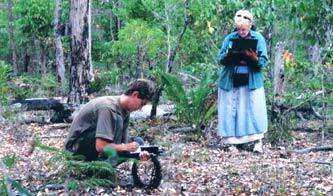 This independent study, conducted over a long period with remote sensing and vegetation change detection has produced scientific evidence that not only is the Warrup forest block WAs last remaining intact State forest still unprotected but also that the forest already logged will not regenerate to its former quality. There is a great deal of misinformation about the management of forests, particularly about their ecological integrity, vitality and health. I have been making these exact same points for over twenty years to different Environment Ministers, and it is apparent to me that they are still being fed exactly the same misinformation by their advisers in DEC and FPC (and CALM before that). The proposed logging will occur in the last remaining extensive tract of high quality mature forest in Warrup block. The forest structure is ecologically mature with old growth characteristics, high biophysical naturalness and extensive incidence of old, tall jarrah and marri with varying sized hollows for hollow-dependent arboreal and avian species. International Treaties on Biodiversity to which Australia is a signatory. Dr Leonie and Ph.D student Rogier de Jong taking light measurements and conducting ground assessments in Kingston block. Leonie has been conducting research in WA forests on behalf of University of Utrecht (Netherlands) and Friends of the Earth International since 1991. A feature sponsored by the Bridgetown-Greenbushes Friends of the Forest in the public interest.